In February 2013 the fragments of a meteorite made landfall in Chelyabinsk Region in Russia. It is the largest known celestial body to fall to the ground after the Tunguska meteorite in 1908. RBTH spoke to leading Russian scientists to find out what they have learned about the Chelyabinsk meteorite over the past two years. Why did no one notice the meteorite? The Chelyabinsk meteorite flew to the Earth from the side of the Sun, Vladimir Surdin, a researcher at the State Astronomical Institute of the Sternberg, told RBTH. According to Surdin, due to the blinding light of the Sun astronomers did not point their telescopes towards this area. This region of the solar system can only be seen through special solar telescopes that are reserved for the study of the Sun. Why did no one die? The Chelyabinsk meteorite was relatively small, only 19 meters in diameter. The Chelyabinsk meteorite resulted in 1,147 injuries, including 259 children. The fragments damaged 3,724 houses, 671 educational institutions, 11 social facilities, 69 cultural sites and five sports and recreation complexes. The Chelyabinsk Region authorities estimate that property damages caused by the falling meteorite equaled approximately one billion rubles (about $16 million). Besides that, it flew along the surface of the Earth, says Dmitri Wiebe, head of the Department of Physics and the Evolution of Stars at the Institute of Astronomy of the Russian Academy of Sciences. A long journey through the atmosphere caused quite delicate meteorite matter to break up into small pieces. Most of these pieces burned up before reaching the Earth's surface. Originally the meteorite weighed about 13,000 tons, but only about six tons of meteoritic material or 0.05 percent of its mass fell to Earth. To date, scientists have collected no more than one ton of meteoritic material. The fragment that fell into Chebarkul Lake near Chelyabinsk weighed 654 kilograms. If this had fallen in the city, there certainly would have been casualties. The residents of Chelyabinsk Region were to some extent quite lucky as the damage could have been much worse. What did this meteorite consist of? The Chelyabinsk meteorite belongs to a class of ordinary chondrites that accounts for over 90 percent of meteorites that fall to our planet, says Dmitry Sadilenko, a researcher at the Laboratory of Meteoritics at the Vernadsky Institute. Chondrites get their name because of the large number of chondrules that they contain (chondrules are rapidly solidified drops of silicate material – RBTH). This means that the Chelyabinsk meteorite had never been a part of any planet, but was made up of 4.5 billion year old matter that formed the planets of our solar system. These chondrites form the asteroid belt located between Mars and Jupiter. Astronomers are aware of about 600,000 asteroids in this belt. Some of them change the trajectory of their flight and approach the Earth as a result of collisions or other factors. This meteorite was probably the most "photogenic" one that man has ever seen, jokes Victoria Chernenko, a senior researcher at the Vernadsky State Geological Museum. 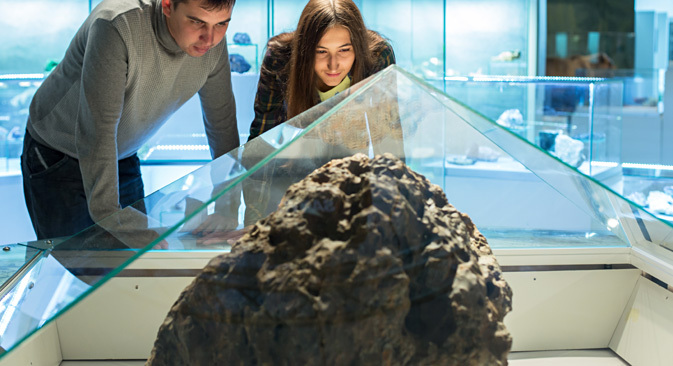 This Moscow museum has one of the meteorite’s fragments on display. Due to the video footage captured by scientists and ordinary citizens, the fall of this meteorite, from its entry into the atmosphere and its flight to the ground, was documented in detail for the first time in the history of scientific research. 2013 asteroid has created an artistic explosion in the city.